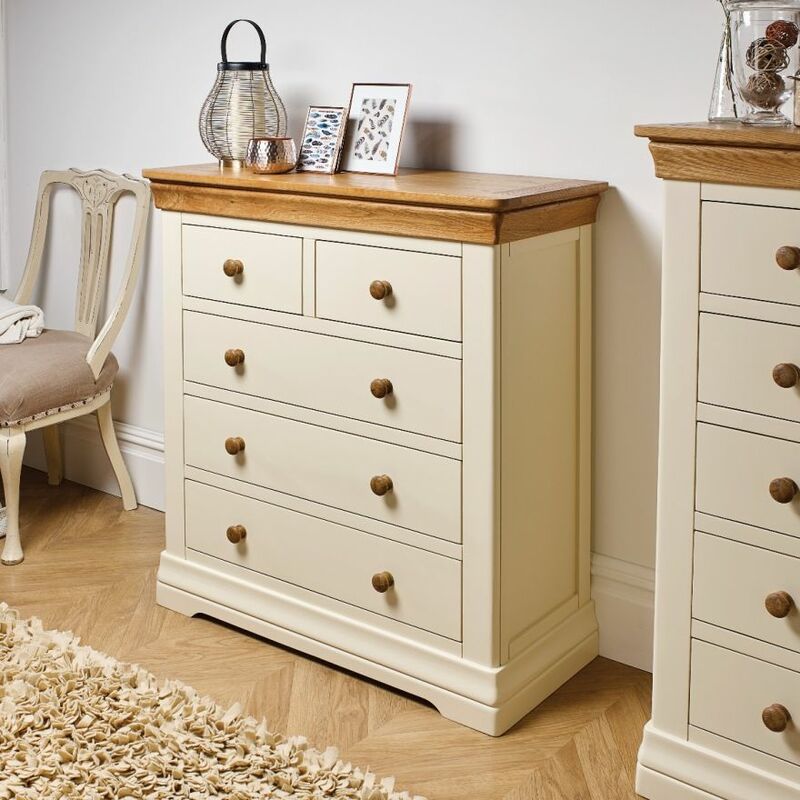 The Farmhouse Cream Painted Country Oak 2 over 3 chests of drawers is hand made my skilled joiners exclusively for Top Furniture. Delivered FULLY ASSEMBLED. 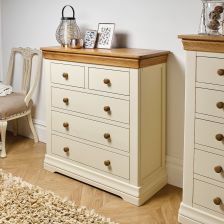 This chest of drawers looks great in the bedroom . already have one and we're so pleased with it decided to get another.very good service and prompt delivery .would definitely recommend . Really pleased, exactly what I wanted. Good quality, great service. Excellent quality, and looks superb. Chest of good quality and the narrower depth suited our needs. Good quality , well packed. 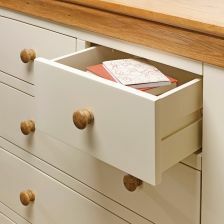 The drawers have tongue and groove type effect to go in and out so nothing to go wrong or break. Well made lovely looking piece of furniture. Bought to go with the triple wardrobes of the same finish. Really delighted. I am sorry to hear the issue you have encountered. I understand that the support team were requesting images of the fault to be sent in to us from the phone call with yourself. I can see that the support team have now received these images so will be in touch shortly to discuss a resolution. Apologies for the issue and any inconvenience caused. Very pleased. Lots of space, looking great. We we very pleased to see the way our furniture was packed. However, when we came to unpack the larger of the two items we were very disappointed to see the quality underneath, as shown in the attached pictures. Two disappointing thigs. 1st the drawers don't come out which would make it lighter to get upstairs. 2nd it appears to have used damaged wood inside see attached photo. There was good communication re the delivery date and the delivery men were really helpful wen delivering the furniture, a big thank you. A very nice unit, very solidly made, and looks very nice in the room. The downsides are that the drawers aren't as big as you would expect, presumably because of the good frame size, and they also have dowels in them so they can't be pulled out. Consequently when lifting upstairs, as we had to, it's a heavy unit that can't be made lighter in any way. The only minor grumble would be that some of the timber that's not in view, i.e. the underside and the back panel are left a little rough and you can pick up splinters when handling the unit into position. Lovely piece of furniture, very good service, we are more than happy with the product and service! 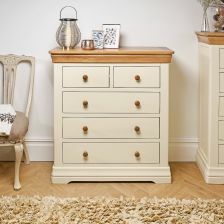 Lovely solid piece of furniture looks very nice in the bedroom, delivery was prompt and hassle free, the drawers are smaller than I expected but otherwise very happy with my purchase.